Then, surrounded by the Pharisees, Jesus asked them a question: "What do you think about the Messiah? Whose son is he?" They replied, "He is the son of David." Jesus responded, "Then why does David, speaking under the inspiration of the Spirit, call the Messiah 'my Lord'? For David said, 'The LORD said to my Lord, sit in the place of honor at my right hand until I humble your enemies beneath your feet.'" We cannot forget the claims of the Scriptures that their messages are from God. Paul reminded Timothy that all Scripture is inspired by God (2 Timothy 3:16-17). 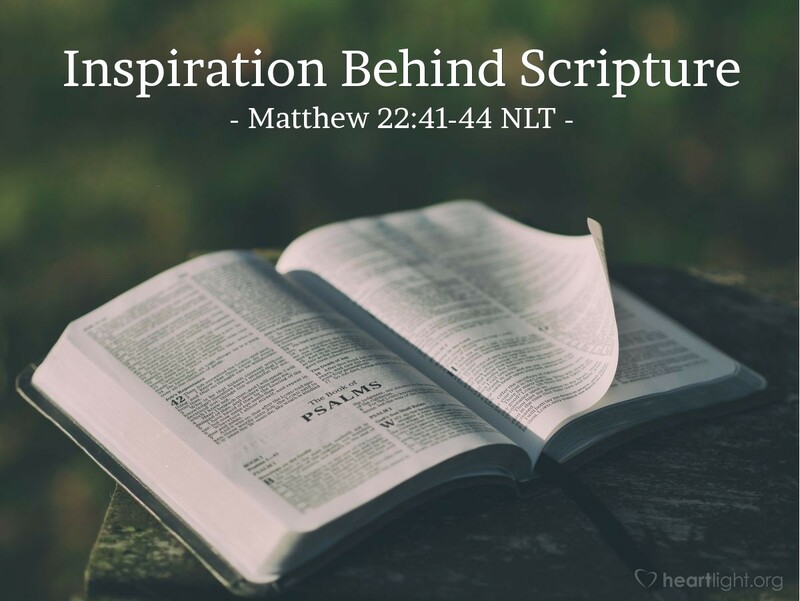 Other places reference God's inspiration behind the words of the prophets (2 Peter 1:19-21) and the writers of the Bible (1 Thessalonians 4:8). As 2 Peter 1:21 and 1 Corinthians 2:12-13 point out, that inspiration came from the Holy Spirit. In today's passage, Jesus quoted from David and weighed in on the inspiration issue. He said that David spoke by "inspiration of the Spirit"! I don't know about you, but this assertion from Jesus is a challenging reminder that I need to invest more time in listening to the voice of the Holy Spirit in the words and truths he inspired in the Holy Scriptures! We are promised that as we open the Scriptures, the Spirit will be at work to help us understand God's truth (1 Corinthians 2:6-16). Father, I thank you for giving us the gift of your words, inspired by the Holy Spirit and given through your human messengers, so that we can know your will and live to bring you glory. In Jesus' name, I pray. Amen.